At ten years old, the spectacle of subway choreography as it collided with street politics and the hilariously suited Michael Jackson, (who'd evidently forsaken zippers five years after breaking up a knife fight in "Beat It"), charmed me to no end. "Bad" was a very mediocre single, but it was aided by an over-dramatic black n' white concrete jungle storyline that followed a neighborhood kid (Jackson) making good while his hoodlum friends (one of whom was played by Wesley Snipes no less) threatened to drag him back into the urban underbelly where he could mug old men. Involving Martin Scorsese to helm an episodic video for the song was an obvious attempt to remake the success of Jackson's "Thriller" video, which had been directed by American Werewolf In London's John Landis. "Thriller," despite its homage to classic horror and its iconic cast of dancing zombies, was more realistic. 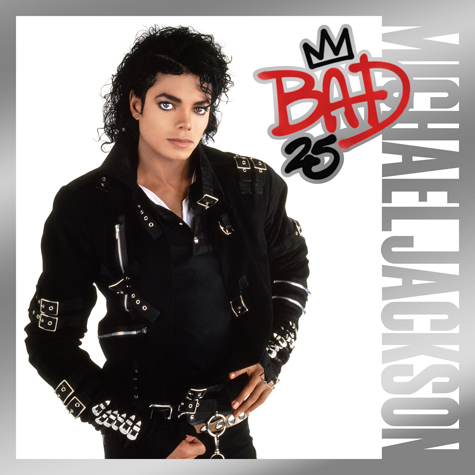 Celebrating its 25th year, Bad remains the last Michael Jackson album that had any real presence for me personally, having undercut my teenage years by three. It spawned most of the videos I remember seeing in 1987 that weren't by Def Leppard, "Dirty Diana" with its Steve Stevens rock pose, "Smooth Criminal" boasting machine gun fire and that anti-gravitational lean and "The Way You Make Me Feel," Jackson's continual pelvic interaction with nothing visible one time warranted a comment from my father: "That's right, Michael! Get the air pregnant!" And then "Man in the Mirror" became the most played message song of the year, video footage of starving children and third world turmoil meant to enliven mankind's charitable nature, motivating the "man in the mirror" to "make that change" and start putting extra pennies in the Unicef cartons making the rounds on Halloween. I think it's fair to say that Bad represents Jackson's last true stand as an entertainer as opposed to entertainment, his later existence as tabloid fodder leading him to eventual ruin. This is not cheap, by the way.